One of the rarely-mentioned heroes of any DX’pedition is the sub-manager at the QSL bureau who has to deal with all the incoming QSL cards! Of course, it’s us that reply to the cards, but at least we get the benefit of having enjoyed a stunning week or two away in the Scottish islands, or somewhere equally attractive. But there’s a couple of important steps before the cards reach us – and that’s those who work for the national QSL bureaus. In the case of the RSGB, after cards arrive in the UK, they are first sorted into several large groups, perhaps all callsigns starting “G4”, or all “G6” calls with suffixes A-M. Each of these groups is then managed by a – voluntary – sub-manager, who sorts them into the individual envelopes provided by the amateurs the cards are destined for. The QSL manager for G(S)3PYE and G(S)6PYE is Rob, M0VFC, which means that cards sent “Via M0VFC” (please!) end up with Wayne, M0WAY, who sub-manages M0MAA through M0ZZZ. 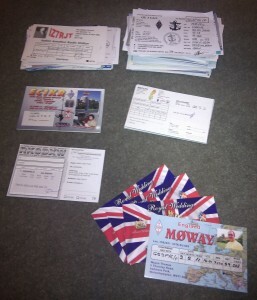 Anyone who wonders how a QSL sub-manager should handle things – look at how Wayne does it! He runs a mailing list to let people know when new boxes of cards arrive from the main bureau, updates them when they’re sorted, again when they’re posted, and emails those who have run out of envelopes. Always forgetting to send off some new envelopes to your sub-manager? No problem: there’s a PayPal link on his website to save you the hassle! We’re just seeing the bulk of the Harris 2010 cards start to arrive via the bureau, so the most recent batch of cards was large. Again, no problem for Wayne – he suggested I send him a “float”, and he uses that to buy the most sensible postage as required. So thanks, Wayne, and all those who work in the IARU QSL Bureau network – you really are stars!